Crystals and gemstones have long been used throughout history for different purposes. Ancient Egyptians used carnelian for protection. The Greeks used amethyst to ease hangovers. The Chinese used Jade for healing their kidneys. 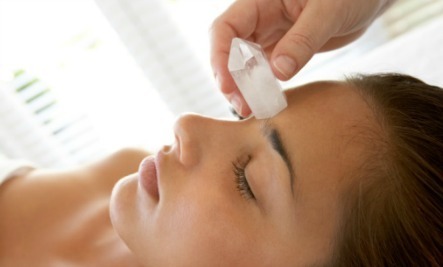 More recently, crystals were used as healing modalities in Europe from the 11th century through the Renaissance. Rulers also wore precious stones in their crowns, not for their opulent appearance, but for their trusted protective and spiritual properties. Recent studies and findings in physics have found that there could be some truth to crystal properties beyond ancient superstition. Most notably the work of Dr. Bruce Lipton, Dr. William Tiller and Dr. Richard Gerber have opened the doorway for modern science to explore the use of crystals and vibrational medicine. As such, crystals are making a comeback! Here’s how you can use them in your daily life. Just remember to use these as a compliment to other traditional methods, especially if you’re going to be using stones to aid in physical ailments. Holding a crystal during meditation can help align your vibrational energy with that of the crystal. For example, let’s say you’re very stressed because of a deadline at work. You can grab an amethyst, which promotes tranquility, and hold it in your hand as you meditate. The amethyst will do its job by aligning your energy with its own, thus helping you get into that calm state faster. For an excellent breakdown of how crystal energy affects our own, check out this video by Spirit Science. Water is believed to amplify the energy of a crystal. So, many people use gem elixirs to introduce crystal energy internally. For instance, let’s say you have a sore throat. You can use a crystal associated with the throat such as aquamarine, place it in a glass of water, and drink it. Please note that there are certain crystals and stones that should not be used in elixirs because they are toxic. Leading expert on crystal healing, Hibiscus Moon, has a blog post that lists which stones to avoid when making elixirs. One very cool and effective way to use crystals in your life is to create crystal grids with certain intentions for your life. In a grid, the crystals are placed in certain shapes and are said to work with each other to bring about and manifest your intention into reality. It’s a nifty way of aligning the space around you with the energy you want to bring into your life. And, since several crystals are used in the process, it turbocharges your intention. Perhaps one of the most popular grids are those dedicated to promoting prosperity in ones life. If this is your intention, then you would find crystals associated with this intention (citrine, pyrite, green crystals, etc.) and create a pattern with them—such as the infinity symbol or a circle—while focusing your attention on what you want to manifest. For a great book on how to use crystal grids check out Crystal Grids: How and Why They Work on Amazon. Bottom line is that crystals have been used throughout history as tools to aid us in our daily lives through their vibrational energy, and recent studies have shown this has scientific accuracy. Why not give it a shot? 4 Are the BPA-Free Alternatives Safe?